Habitat is Critical to Species Survival! Nova Scotia includes a variety of habitat, from windswept coastal areas to tidal mud flats, to boreal forests, grasslands and agricultural areas. And the sea around us is in itself a rich and fascinating environment for many marine species. NS has a modified continental climate, owing to the presence of the ocean with its moisture-laden winds. Our generally acidic soils in many parts of the province also determine what plants will thrive here. 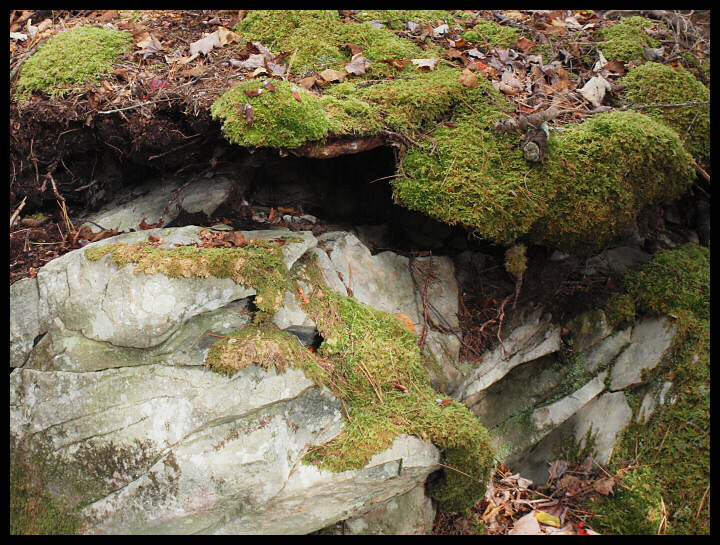 This habitat noticeably alters where limestone and gypsum are prevalent, especially in Hants County. 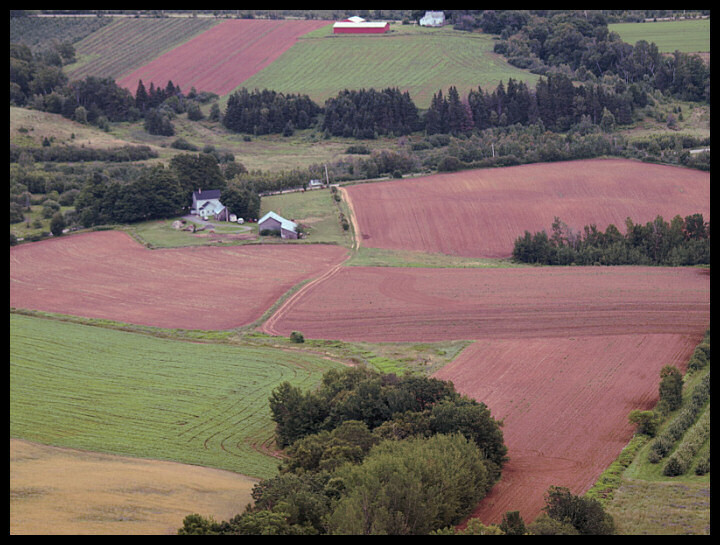 Soils vary as well, from the fertile farmland of the Annapolis Valley to the massive boulders and glacial till deposited along much of the coastline. I hope you'll enjoy viewing some of our provincial landforms and the vegetation that accompanies them. Our freshwater lakes and rivers are very acidic in the southern part of the province. 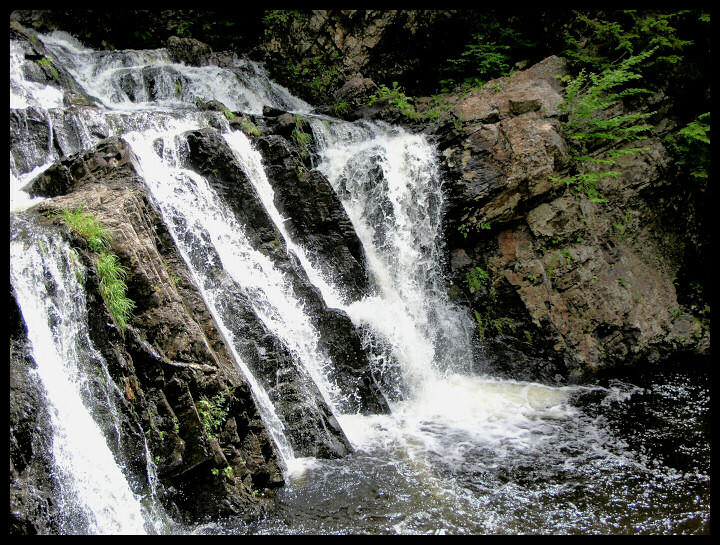 The water itself often has an amber tinge owing to peat content and dissolved minerals, such as the waterfall at Gardner's Mill in Yarmouth County. Many of our lakes are glacial in origin and quite a number are spring-fed. Because of the ready availability of ground water, many residents create large ponds on their properties, which attract various animals and birds that are drawn to the ponds' residents as a source of food. Nesting sites for marine birds are often located on rocky islands just offshore. At left is a small island in Yarmouth Harbour where various sea birds congregate. The rugged shoreline at right is located just off Pinkney's Point, Yarmouth County, where crowds of gulls and cormorants can be seen. Tide pools and coastal waters provide shelter for plants and marine animals. There three photos were all taken at Cape Forchu, Yarmouth County. The rock cliffs formed from ancient Silurian lava flows.The enormous boulders are glacial erratics, often transported over long distances from their original source. Kelp, rockweed and other salt-loving plants are found in abundance and provide both food and shelter for numerous creatures. Here's a glacial erratic boulder located far inland. The presence of dark lichen indicates its acidic character. Many of the granites and greywackes intensify the acid content of the water as they erode and break down. Our waters are also seriously affected by acid rainfall from industrialized central Canada and the north central US. Maple, beech, birch and oak are predominant hardwoods across much of the province. Conifers such as spruce, fir, tamarack (hackmatack, larch) and hemlock are also adundant although some species are more common in certain areas than in others. 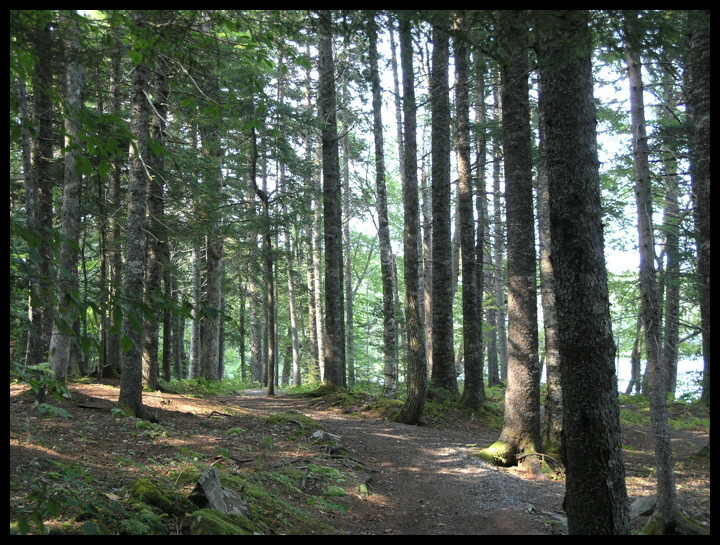 Old-growth hemlock forests are rare; one example may be seen at Keji Park. 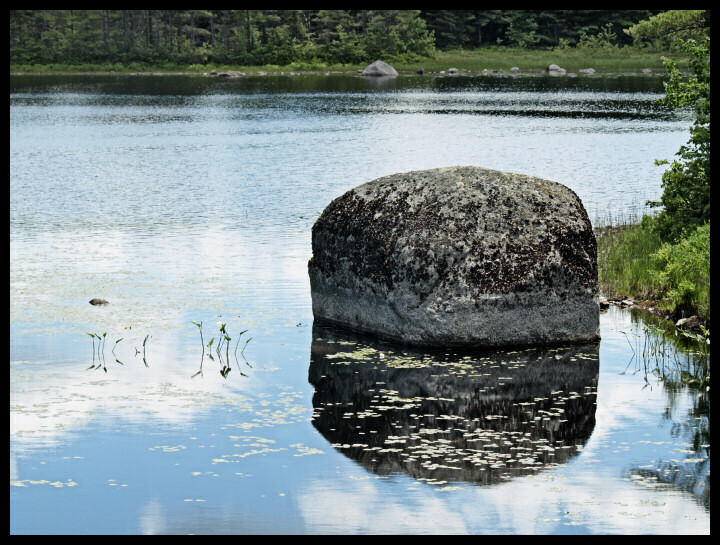 This photo was taken in Ellenwood Provincial Park not far from Yarmouth. 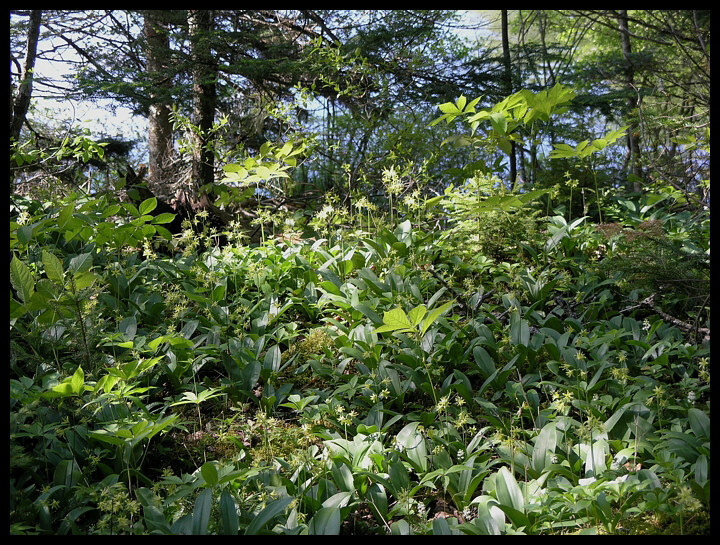 The understory of most Acadian forests will include a mixture of herbaceous plants and perennials. Here in the Pocket Wilderness at Moody's Corner, trout lilies, lady's slippers, trilliums, ferns and mosses carpet the forest in May and June. They benefit from the sun-dappled shade of the trees overhead. 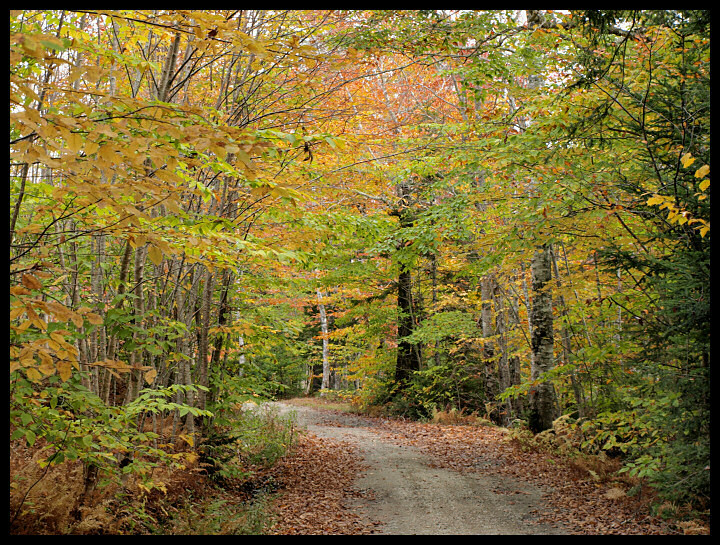 Coniferous forests are normally found in more northerly areas of NS, or at higher elevations. However, they are also intermingled with the deciduous Acadian species. This photo was also taken at the Pocket Wilderness, as was the one above. Spruce, fir and hemlock are the most numerous species in this particular location. Pines, while present, fare better on the drier soils of the central Annapolis Valley. 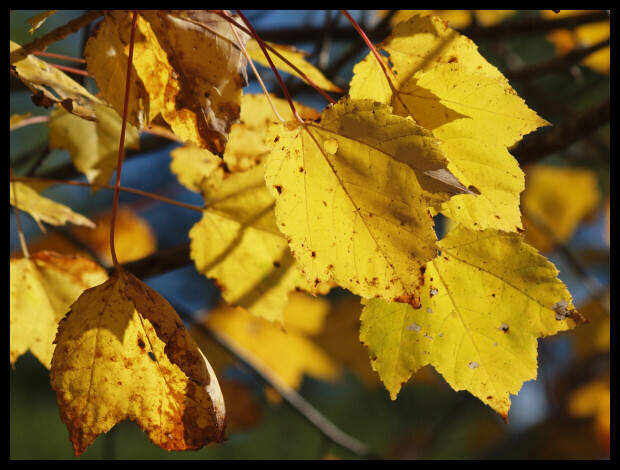 The striped maple, preferring moist areas and not a commercially valuable hardwood, offers a touch of golden beauty which its wide leaves display each autumn. 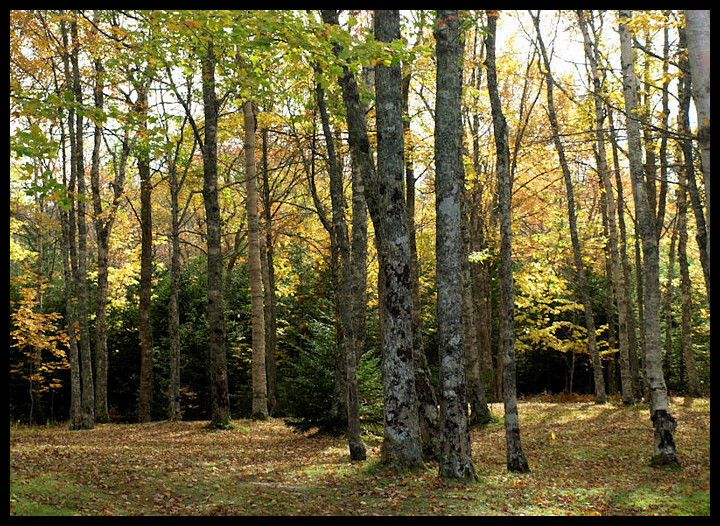 Here can be clearly seen the mixed forests so typical of southern NS, with their beautiful blend of taller pines and spruces, and their younger understory maples and beeches. Smaller shrubs such as viburnum, blueberry, bay, alder and rhodora are frequently found as well. Around the Minas Basin, tidal mud flats provide rich feeding grounds for many species of migratory waterfowl such as semi-palmated sandpipers, plovers, willets. This is a cloudy-day view of the beach at Medford, taken from the Lookoff on top of North Mountain above Canning. Ancient dinosaur trackways have also been discovered here. 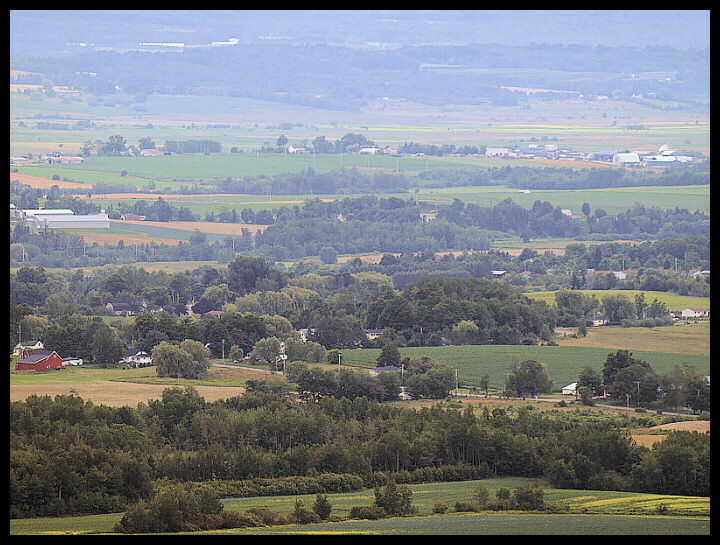 Annapolis Valley near Canning, in the mist. The fertile soils in this region permit the growing of many different crops. The resulting orchards, vineyards and cornfields provide habitat for wildlife including deer, eagles, hawks, crows, songbirds, raccoons, porcupines, foxes and other small mammals. The bald eagle population in this area is thriving thanks to the offal from poultry farms, which in turn encourages Eagle Watch programs that bring many visitors to the community of Sheffield Mills in late winter when the birds are especially plentiful around the fields where they know they will find free food. Fields below the Look-Off in Kings County, where numerous birds can often be seen gathering insects and bits of grain that are revealed during plowing. The red soil is typical of the area, which was once part of North Africa until the supercontinent of Gondwana broke apart. It is Triassic in age. 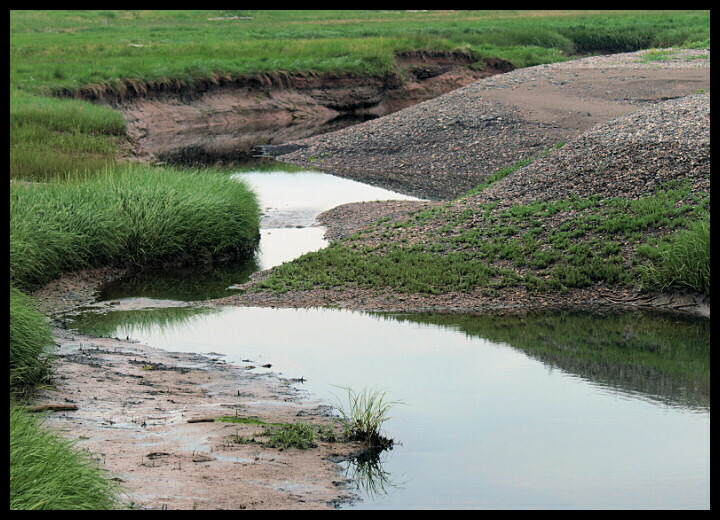 Here, a tidal creek in Scots Bay near Blomidon is host to coastal vegetation and the creatures that call it home. Shorebirds wade through the shallows and harvest whatever food the tide uncovers, from soft-bodied worms to crabs, clams and snails. Herons wait on the banks for fish. Some fish species such as gaspereaux (aka alewives, kayack) use the larger tidal streams as spawning routes and migrate upriver in mid-spring. Scots Bay is a mecca for rockhounds in search of agates and other semiprecious stones. The rocks here are largely volcanic in origin, of Jurassic age, and smooth pebbles along the beach or the creek margin provide evidence of repeated glacial action over the millennia. The softer Triassic soils have been either eroded or covered by the lava flows. 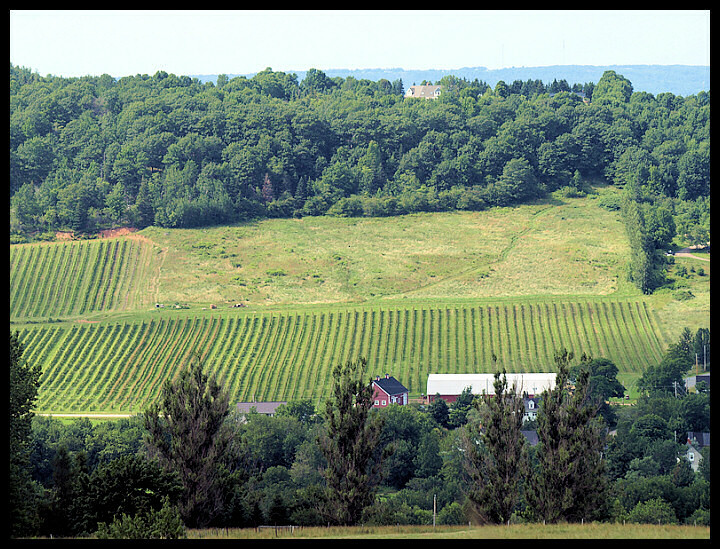 The microclimate of the Gaspereau valley, protected by a ridge that divides it from the larger Annapolis Valley near Wolfville, permits vineyards to flourish. Grapes are a fairly recent introduction to the agriculture of the area and several local wineries are now producing world-class vintages. Here, too, live many birds and mammals that are drawn to the open fields, availability of fruit (grape netting is essential!) and presence of a shallow river that winds from the North Mountain to the Minas Basin. 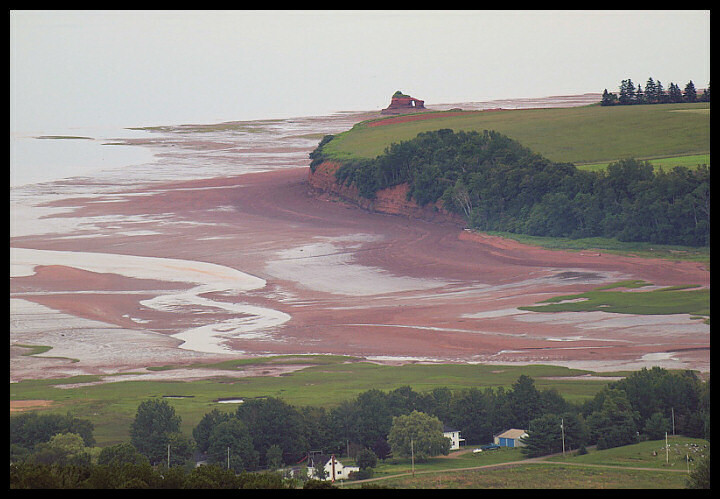 At the eastern end of the Minas Basin, the beach around Burntcoat Head is washed by the world's highest tides, which normally exceed 50 feet in range. Fossils of very early dinosaurs and amphibians may be found in the cliffs here. Shot taken from the lighthouse. 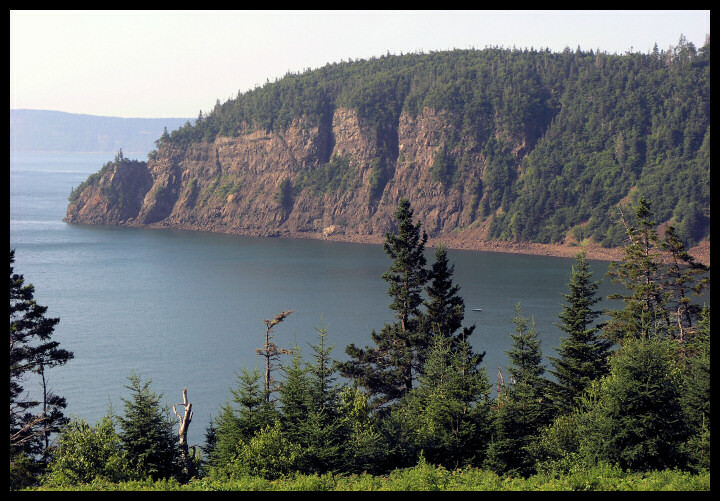 Cape Sharp near Parrsboro. Across the Minas Basin from Blomidon and Scots Bay. in Cumberland and part of Colchester County, the terrain changes. The Cobequid-Chedabucto Fault runs across the province from southwest to North East, "sandwiching together" two distinct continental remnants. The southern part of the province (Meguma Zone) was wrenched from Gondwanaland and the northern (Avalon Zone), from Laurasia - another continent entirely. 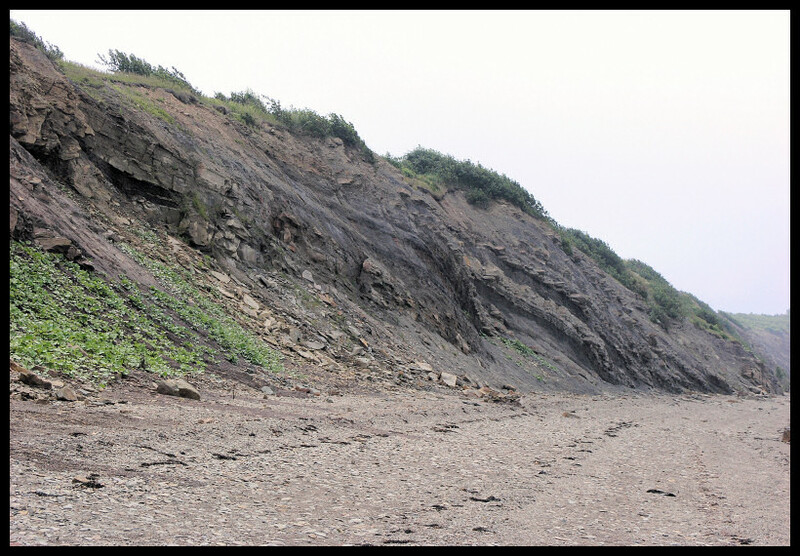 Sheer sea cliffs near Parrsboro contain minerals such as copper, and Jurassic fossil beds have made Wasson's Bluff a magnet for paleontologists. 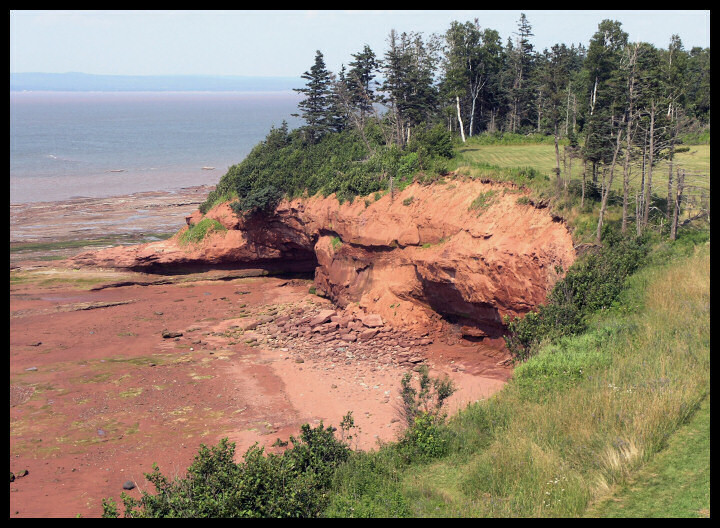 The ancient creatures found in these beds are distinct from their counterparts in the rocks of Blomidon, suggesting an extinction event that has occurred during the time when the two separate strata were laid down. There are also distorted Carboniferous rock layers on this side of the Basin, as seen here. Waterfall in Victoria Park, Truro - faulted rocks, and erosion of Carboniferous strata by the brook. Coal seams in the cliffs at Joggins, NS. Now a UNESCO World Heritage Site, Joggins is famed for its Carboniferous fossil cliffs that contain ancient lycopod forests, fossils of amphibians, dinosaur trackways, plant remains and many other types of material. Many of the fossils contain traces of coal since this region was once a vast coal swamp. 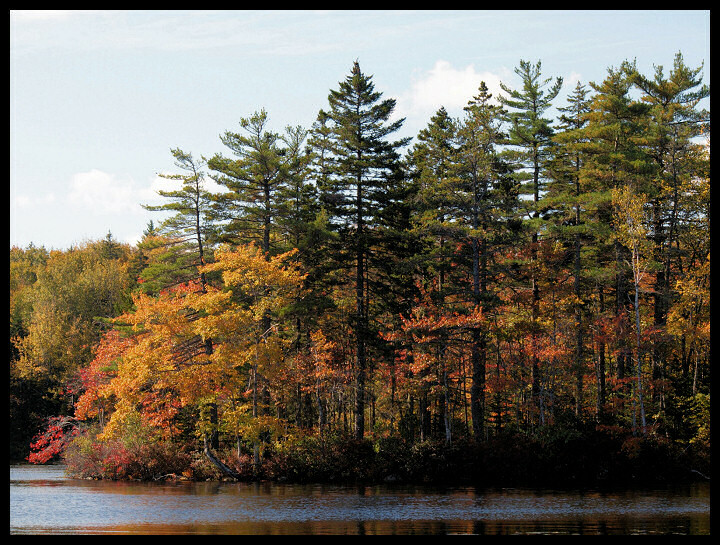 Unlike the Acadian forests further to the south, this landscape contains a higher proportion of conifers. 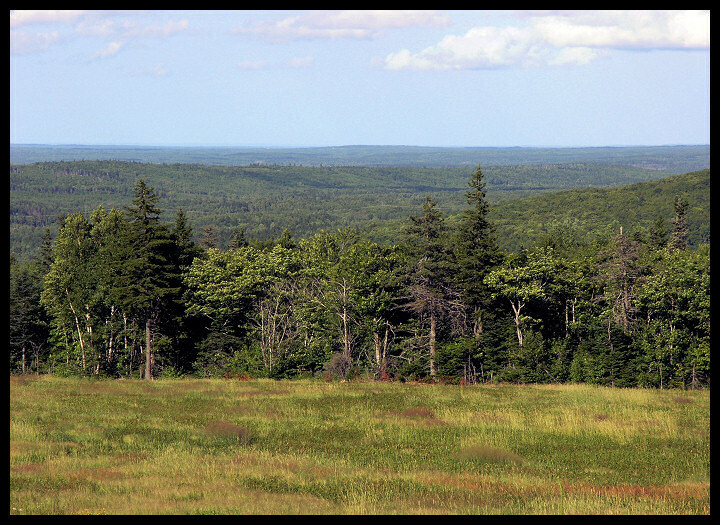 The terrain itself is elevated, and slopes toward the Northumberland Strait in the distance, dividing Nova Scotia from Prince Edward Island. At least half of the remaining mainland moose population in NS may be found in the Cumberland hills, where human habitation is less dense than elsewhere.